11-2, secured #1 seeding and bye week. Bigby's gone down injured, the Skrine gravy i thought would dry up with the return to health of a couple of starters - and it is - hence the Brown add. Congratz to all who're here and commiserations to all that arent. Its a tough league and i expect itll all change come next season! I'll update this some more with some commentary on those teams in action during the bye and WW info in the coming days. EDIT: Ill update this accordingly, but all change. 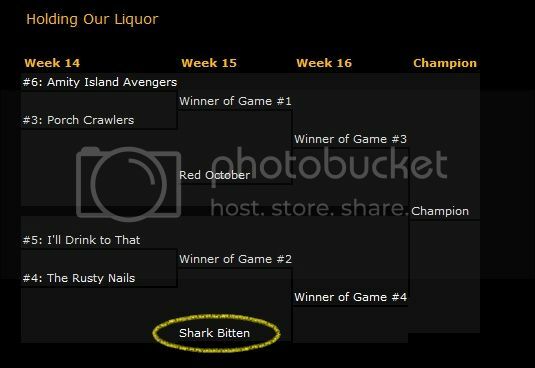 Joe (Red October) pipped us to #1 spot and as a result my bye will see me matchup against one of Porch Crawlers or Amity in wk2. Well done Joe! Congrats on an excellent regular season sir. Kilroy1872 wrote: Congrats on an excellent regular season sir. From another team owner that has taken on a team languishing in the basement of the league. Who is also another year into rebuild and with yet another post season appearance? Those two L's - either one of them (one thanks to a pts correction turning a slender win into a even more slender loss and an outright hammering at the hands of October) - which cost me #1 seed is biting me in the rump right now. 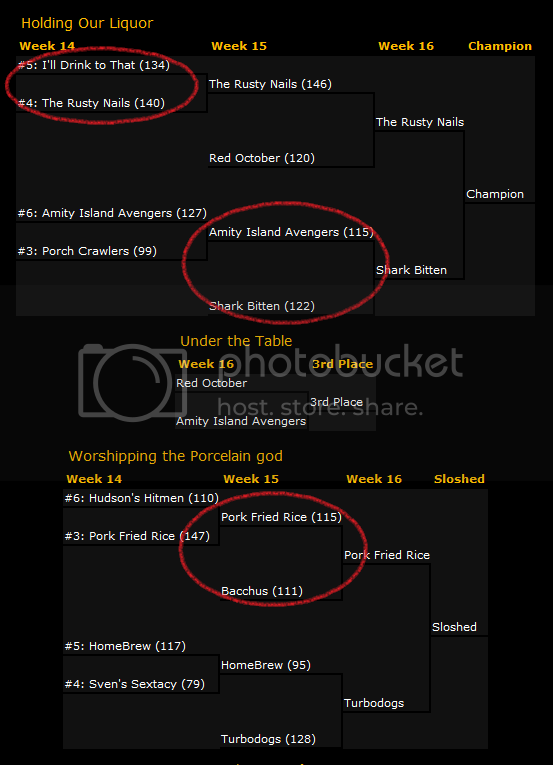 As usual the Amity/Bitten game is another close one. Im down 8 Pts heading into tonights game. I got two left to play, hes played out. Thats the good news. Its doable. But its very far from being very likely too. 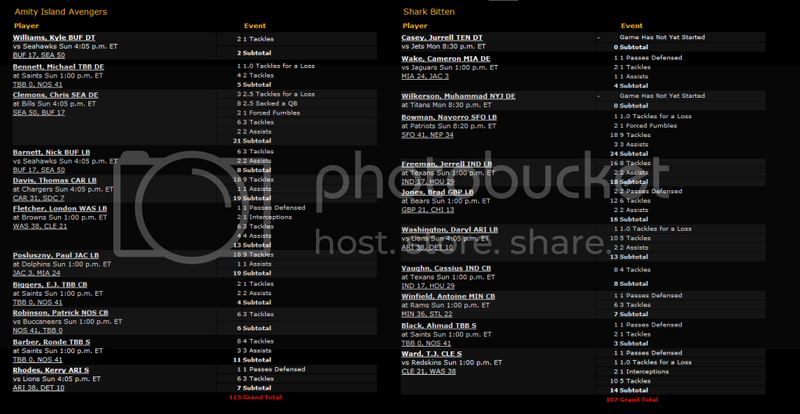 Theres also alot to catch up on from the 1st round of playoffs too, all of which i'll do tomorrow. You have my word As well as looking fwds to whoever makes the finals and the roster dilemmas theyll both be facing. Well played Gary, whichever way it goes down. Another great season and another close game. 15 FPts (largely thanks to Mo Wilkerson wading in with 12 Pts - we needed 7 - +4 Pts of which came from a great play - blocked FG) made it look better than it was. Clemons monster game vs the Bills current injury ravaged line was a great matchup and almost sank us. As did the decision to risk playing Ahmad Black while TBB were playing musical chairs in the secondary (injuries). Some very close games. When you consider its 2pts for a solo and 1 for an assist and we start 1 DT, 2 DE, 3 LBs, 2 CBs, 2 S's & 1 Flex at any position and you can see what i mean when i say really tight. Those 3 games could easily have gone a different way on another day. Heck, they could easily have gone differently on the night!! Kurt Coleman: Being moved to FS, that could diminish his value, have no impact, or (unlikely but possible) increase his value. Debate away, but its pretty much the last thing you want to hear going into your championship game of a player you were - more or less - counting on. Corey Lynch: Im not sure you can consider yourself in good shape when youre counting on Lynch to be a "Lynch-pin" at the back. And i am. Colt Anderson: The "New" SS in PHI. His stats to date havent been what youd call prolific by any standards. Hes on the roster purely because i dont know what will happen to Colemans numbers. Not a clue. At this point im really glad i drafted Harrison Smith. Remember the safety mess and how i was counting on Lynch? Well in another k-nick in the k-nackers, SDC are going to roll with Brandon Taylor at Safety. Corey Graham (BAL) is the best of a bad bunch right now. Hes been picked up and Lynch dropped. 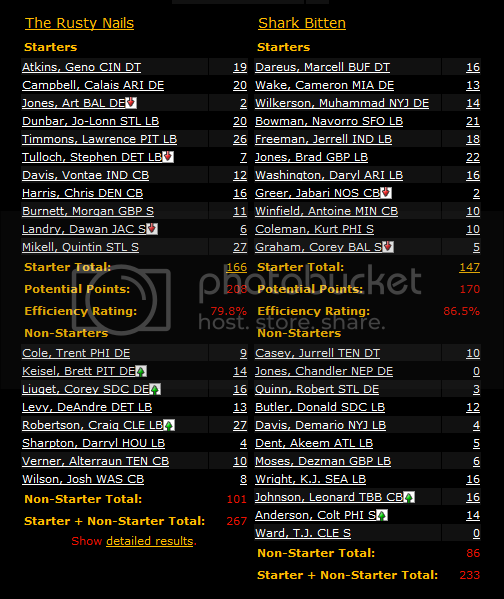 Dropped Cassius Vaughn, added Jabari Greer @CB. It was a well fought game and i dont think either of us left all that much on the bench to be honest. I had a catalogue of disaster at Safety which didnt help, but even so the winning margin suggests it mightnt have made all that much of a difference. Credit to Bunny who beat #1 & #2 seed en route to the championship! IDPeople wrote: CONGRATULATIONS TO BUNNYWAFER!!! What was the name of the delinquent team from 2 years back? NMGhostrider wrote: What was the name of the delinquent team from 2 years back? I use that team name and have never been a delinquent owner in anything. 2) Yes, Jesteva has never been a delinquent owner. In fact, you'd have to go a very, very long way to find a more conscientious or more thorough owner. When i used delinquent i was using it in the classical sense (delinquere: de - away & linquere - to leave). Vacant would have been just as accurate in terms of what was meant. Colloquialism ftw and apolgies if there was any misunderstanding. Dare i say, mea culpa? My attorneys have withdrawn the slander litigation that was pending.